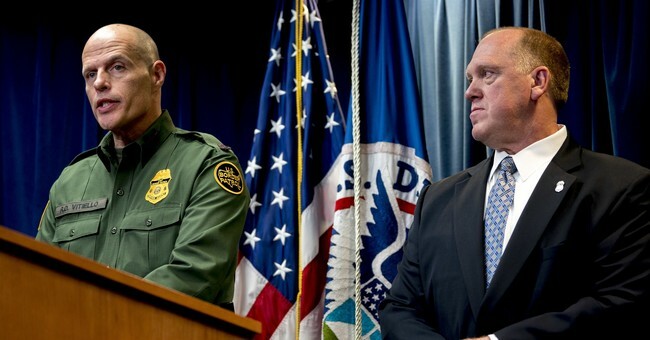 Retiring U.S. Immigration and Customs Immigration Enforcement chief official, Thomas Homan, spoke with the Washington Examiner's Anna Giaritelli to discuss his time in the agency and what can be improved upon to increase border security. Homan remarked during the interview that, of the six administrations that he has worked for, no commander-in-chief has more positively impacted the border than President Trump. "It’s just a fact that our sitting president of one year has made a big difference," Homan said. "I've worked for six presidents. I started with Ronald Reagan...No one has done more for border [safety], public safety, and law enforcement than President Trump." But President Trump is be stifled in his efforts by Congress, Homan asserts. "I would like President Trump to work with Congress to get our needed resources. We need money to do our job," Homan told Giratelli. "The president has tried. He talked about giving us 10,000 more officers. We haven’t seen that happen yet because Congress hasn’t funded it." This problem is only exacerbated by certain Democrats' call to abolish ICE, he adds. "It's insulting that a member of Congress would say 'abolish ICE' when we're enforcing the laws that Congress enacted. They give us a set of laws that we're supposed to enforce and they give me the money to do it, then say 'abolish ICE,'" Homan explained. "We’re doing what you told us to do." Furthermore, Congress is not giving President Trump the necessary funding for ICE agents to do their job to the best of their ability. "I would like President Trump to work with Congress to get our needed resources. We need money to do our job," Homan told the Washington Examiner. "The president has tried. He talked about giving us 10,000 more officers. We haven’t seen that happen yet because Congress hasn’t funded it." Homan officially retired from hist post on Saturday and will be replaced by Ronald D. Vitiello. "As U.S. Customs and Border Protection Acting Deputy Commissioner, Ron has more than 30 years of experience working in law enforcement and protecting our nation," Department of Homeland Security Sec. Kirstjen Nielsen said in a statement. "Deputy Commissioner Vitiello brings to ICE the vision and leadership needed to continue the exceptional work the agency is doing to accomplish its crucial national security and public safety missions."